Do you ever have those knitting projects that last a life time? Like, practically an entire, actual life time? I'm not talking UFOs that are piled up in the corner that, if you're honest with yourself, you have no intention of finishing. I'm talking about projects that remain on your to-do list day after day, week after week, month after month, year after year. 1. 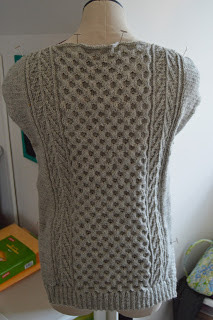 First up, and youngest of the bunch, is my Honeycomb sweater. I started knitting it on January 14, 2017. Almost exactly one year ago. That's really not that bad, except that it has remained on my to-do list for an entire year. That and the fact that I've gained some weight and the sweater probably won't fit now. (Insert pouty face here.) I need to pull it out of my knitting bag and verify the sweater's smallness, but... I'm thinking I'm going to cut the ribbing and arm holes off and sew it into a pillow cover. Presto-magic! One life time project done. Is it bad that I almost hope the sweater is too small just so I can easily wipe if off the to-do list? 2. Next up is a pair of socks. According to my notes, I finished knitting them on August 16, 2016. But they remain in my knitting bag waiting for the toes to be kitchnered. And yes, that's August of 2016. Not 2017. 2016. I have been lugging those poor socks around for over a year and a half. I need to do something about that. 3. And last, a striped cowl. According to my notes, I started it on February 17, 2015. As far as I can tell, I've never even mentioned it here on the blog. 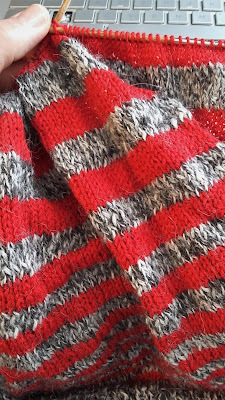 It's knit in ever-growing stripes with left over bits of Prime Alpaca Peruvian Tweed from Woven Gems and a skein of some kind of red sock yarn. It's such a simple knitting project and that alpaca is incredibly soft and enjoyable to knit with. How on earth did it manage to spend two years on the bottom of my knitting bag? Good grief! Hopefully by January 31, 2018 (it's sad that I need to specify the year!) all three of those projects will have a big check mark in the Done column. Join me over at Carole Knits for today's Three on Thursday link-up. I have a cabled sweater from somewhere around 2008? that is languishing. And that is my oldest and only knitting UFO. All others were unwound or dealt with. That one just won't be decided. I can't frog it, but not sure I will ever finish it. It's a pullover and in my current state of hotness I need cardigans! :) I'm definitely at the cardigan stage of life! I'm a bit of an organizing freak, so I can't have projects lingering in my bag/basket. If something lingers too long I either finish or frog it. I bet you'll hit the goal for at least two of the projects! 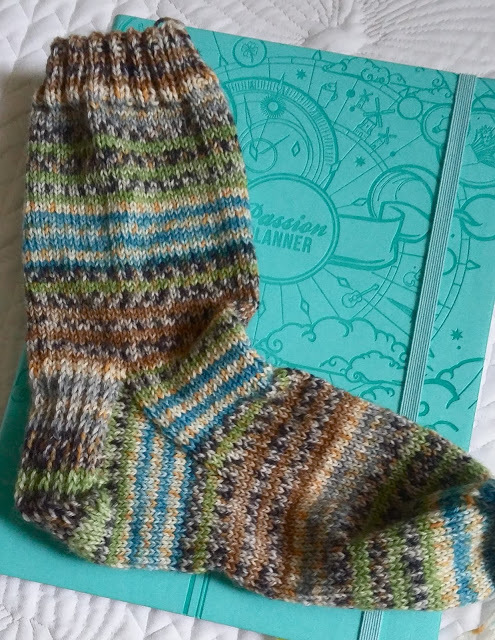 New socks and cowl would highly motivate me that close to the finish. beautiful sweater that might not fit....I'd backburner it! Yay! The cowl is now finished. Place your bets on which gets done first - the kitchnered toes or a sweater. On my way! :) The socks would be so easy to finish, but knowing me, I bet I finish the sweater first. Watch out! I might take you up on that offer. It's not that I mind doing it, but that I need silence which never seems to happen around here. Another volunteer here to do the kitchenering - lol. Love that sock yarn. And the cowl (and I see above that it is NOW finished!!). The honeycomb sweater is awesome -- and it would make a gorgeous pillow as well. Soldier on!! Thank you! I can't believe all these kitchener volunteers! I also can't believe I just realized - I think I've been spelling it wrong for the past 20 years! Aack! Yes! I do Love the sensation of checking things off the to-do list! I think it's amazing that you can keep track of projects and when you started them. Even my Ravelry notebook is messy! That Honeycomb sweater is so beautiful. I say that a pillow is way better than frogging all that gorgeous work. I'm horrible about keeping Ravelry updated but I'm a little OCD about tracking my knitting in a notebook. I'm also Horrible about frogging large amounts of knitting. I'm much more likely to just throw it away & pretend it never happened.